There are many examples throughout the Bible concerning the bride price or dowry, the betrothal and its ceremonies. After Abraham's servant had carried out the negotiations for Rebekah, he "brought forth jewels of silver, and jewels of gold, and raiment, and gave them to Rebekah: he gave also to her brother and to her mother precious things." Then the account tells of the betrothal feast in these words: "And they did eat and drink" (Gen, 24:53-54). When Hamor asked Jacob for his daughter as a bride for his son, Shechem, he said: "Ask me never so much dowry and gift and I will give according as ye shall say unto me: but give me the damsel to wife" (Gen. 34:12). That the bride price was paid in other forms than money is borne out in the case of Othniel (Joshua 15:16,17) and David (1 Sam. 17:25; 18: 17-27). 15:8 What woman having ten pieces of silver, if she lose one piece, doth not light a candle, and sweep the house, and seek diligently till she find [it]? 15:9 And when she hath found [it], she calleth [her] friends and [her] neighbors together, saying, Rejoice with me; for I have found the piece which I had lost. 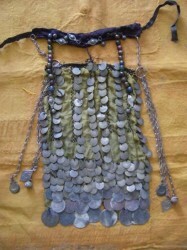 The ten pieces of silver mentioned are most likely part of the bride price that the daughter received. The Bedouin headdress combines a rectangular scarf of black silk georgette with a diagonally folded band. 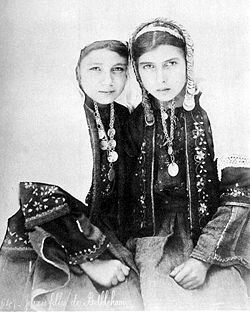 The thin scarf is draped around the head and under the chin so that the throat is covered. The folded band is tied squarely on the head so that it covers most of the forehead. 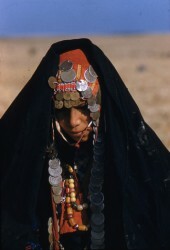 The Bedouin woman pulls her hair out from under the veil to frame her face. 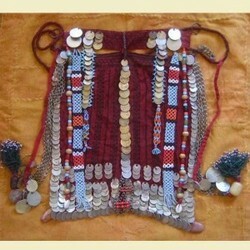 She sews her gold and silver dowry coins on her headdress and likes gold or silver anklets and bracelets. 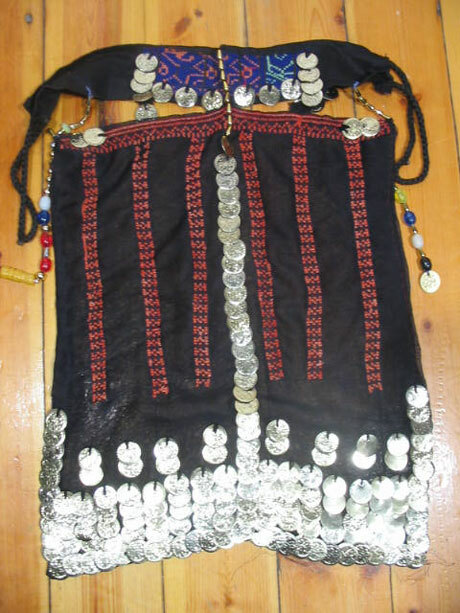 In the Middle East, it is a common custom that the woman is entitled to all her wearing apparel, therefore, any wedding dowry she receives she will normally wear. 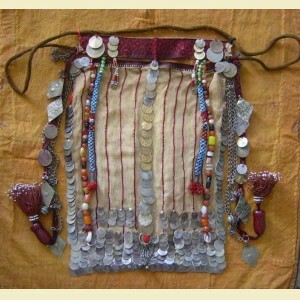 This quite often consists of coins, jewelry, bracelets and the like. 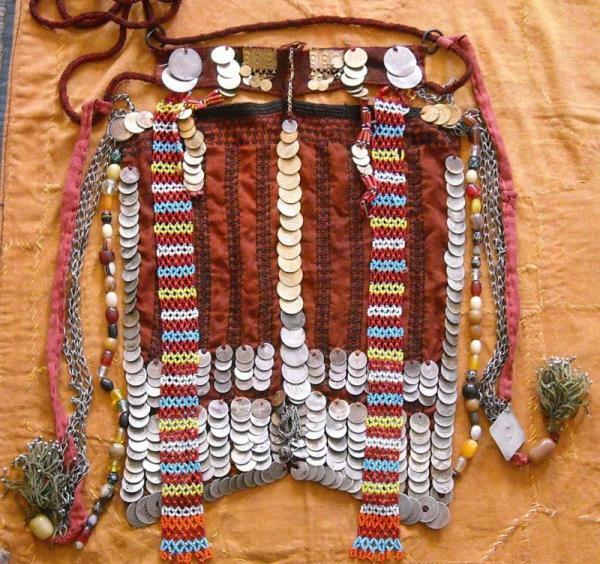 You might spot a Bedouin Girl with a row of coins missing from her head dress,this would indicate that the family may have needed to pay for something such as for a doctor or a debt. 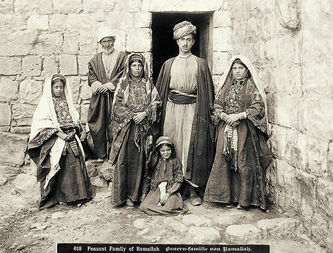 The woman was the keeper of the family wealth. Just as the mother or in Hebrew the "em" was "the one that binds the family together”. The Husband would entrust this Wife to guard the Family finances! 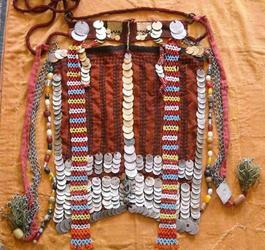 After this thurough investigation into the Bedouin custom of wearing the Bridal dowry ,you can better understand how its origin is based on biblical wedding practices and customs.This had been done long before it was adopted by pagan groups who added amulets and talismans to ward off evil spirits. **It is an unfortunate thing that beautiful Biblical practices are taken and twisted into something worldly and unholy.This should not keep those who are doing good things from practicing these wonderful ancient customs.The bible clearly warns against celebrating as the pagans do but this does not mean that when pagans take a good thing and call it there own that it now becomes unholy! !Think about it! 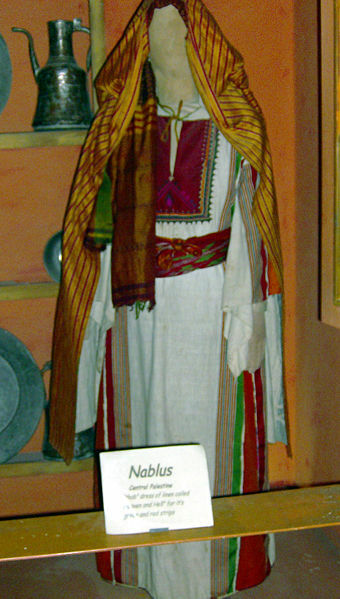 The loose, unencumbered dress of the Bedouin woman is well suited to her nomadic life for it requires little maintenance. Although black is the dominating Bedouin color, women of some of the tribes dress in blue. The garment is long and ample. The armholes are deep to permit a wide sleeve. 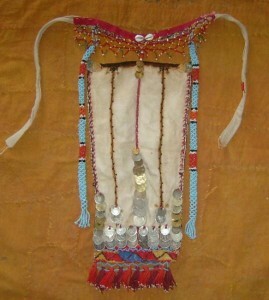 The dress opens to the waist and is usually unbelted. When a belt is worn it is tied around the hips and serves to support the figure as well as to adjust the length of the garment. Old Bedouin costumes were richly embellished with fine hand embroidery worked in cross stitch. The design was embroidered across the front and back of the bodice, down the sleeves and along the main seams. Machine stitched embroidery now takes the place of hand work generally. 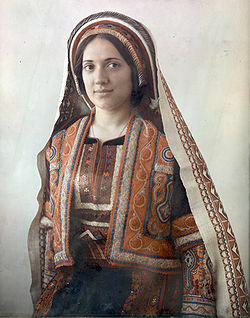 The embroidery is of a contrasting color, usually red or yellow. Blue dresses are embroidered in black or red. 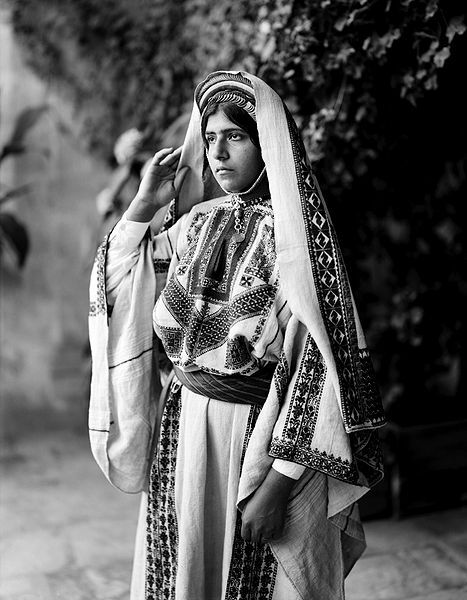 Bedouin wedding dresses are as gay as their everyday dresses may be somber. The bride buys the most luxurious material she can afford and if she has a choice she will pick a shiny, highly ornamental fabric such as brocade, cut velvet, or printed silk. The style of the dress is very simple and it has long sleeves. 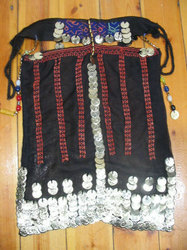 It may be caught in at the waist with a silver, gold, leather or folded fabric belt. This is a wonderful more modern version of a Bedouin Dress,notice the detailed embroidery on the dress and veil.In this case it is obvious that the Dowry given to this bride was jewelery!!! !